Dollops of Diane: Happy Leap Blog Day! Hey All – Looking for your daily Dollop? Well in honor of Leap Day, we switched things up and I am actually guest posting on Tiaras and Tantrums. To read up on what I learned after being away from my family on a mini vacation, you’ll need to click here, but before you do make sure to check out Cathe’s post below. For those who aren’t familiar with Tiara’s and Tantrums, Cathe is a fun, witty, honest, hardworking (as in outside of the house!) mom of two. She is new to blogging and I already love her (maybe that’s just because she breeds red heads and I’m biased). So check out her post below and while you’re at it, why not follow her new Facebook page as well? See you back here tomorrow for our regularly scheduled program and don’t forget to head on over to her page today to see my post! I am SO happy to be guest posting on Dollops of Diane! I was thrilled when she agreed to swap blogs - and can't thank her enough for her guest post as well. Truth be told, I am a procrasti-planner. That's someone who likes to plan things but usually ends up doing everything the last minute. For example, this special Leap Blog Day Post. It's 2-27-12 and 10:30 p.m. I have to get up at 5 a.m. I can't seem to tear myself away from my computer or my 5 DVR'ed episodes of Criminal Minds. I went back and forth on what to write about - I wanted Dollops of Diane readers to be able to get to know me - so I decided on an interview with myself. FYI: I don't have multiple personalities (my husband probably disagrees). Me: What the heck is this Leap Blog Day thing? Me: What is your Blog about? Me: It’s about my life as a working mom/wife and all of our crazy adventures as family. Nothing ever goes as planned in our life and even the fun things usually end up with someone screaming and someone else begging for a bandaid. I eventually want to incorporate recipes, crafts, decorating ideas etc. in my blog too. I love to write, but planning parties, making crafts, and writing lists is my passion so I'd like to eventually combine my passion with my love. Me: When/How/Why did you get started blogging? Me: January 2012 – Starting a blog was on a long list of New Year’s Resolutions, and just about the only one I’ve stuck with. The first blog I read regularly was “High Heels and Dirty Dishes”, which is written by one of the girls I went to school with. After several months of reading her posts, I kept thinking “What a great outlet…I so need something like that.” My first post was in January and made up for not sending out my 2011 (or 2010 for that matter), and it was a recap of our entire year. As for the why, I needed somebody to vent to. When my husband had ticked me off, I would write a post about it. When I’ve had a crappy day at work, I write a posts about nearly everything – of course not everything will get published (and some never will) but I feel a million times better once I’ve been able to type non stop for a good 10 or 15 minutes. And as an added bonus: Nobody gets stabbed in the eye with a sharp object. Ummm...Winning, duh! Me: How did you choose the name of your blog? Me: Well, it started off as an ode to my children. They both take turns wearing the tiaras and throwing the tantrums a majority of the time in our house. In reality, the more I thought about it, the more I realized that EVERYONE takes their turn wearing a tiara now and then. At some point, even the most selfless people have felt entitled to something - it may have been as small as someone taking a front row parking space that you had wanted, but at some point in everyone's lives, we have all felt entitled and worn. Everyone also throws an occassional tantrum. You don’t have to throw yourself on the ground kicking and screaming to say you're a tantrum thrower. When I throw mine my head starts going from side to side and my finger gets shaken a lot and I point at whatever I'm angry at. When Brayden throws his, he throws his arms in the air and then falls to the ground like a limp noodle sobbing. When Emma throws hers, she releases a scream that compares to nails on a chalkboard and her face gets really, really, red. When my husband throws his – he just gets a look on his face and won’t talk to anyone. We all do it, some will admit it and some will deny it. Me: Tell the readers something about yourself. Me: I love all frozen coffee drinks, but my favorite is a caramel frappuchino from Starbucks. I love to dress my kids alike (at least in the same color). I love to celebrate all holidays (big and small). I love decorating and party planning. I love watching movies but I’m partial to TV shows. I could sit and watch Criminal Minds and American Idol 24 hours a day. I’m not a great cook but I pretend to be, which usually results in disaster. I love glitter, the color pink, clearance racks, high heels, lip gloss, and hot glue guns. I can’t stand no fat cheese, migraines, messes (although you couldn’t tell that if you walked in my house), severe weather, socks, and mushrooms. Double gag on the last one. Oh - I apparently say a lot of bad words to – at least according to my kids - who repeat every damn one of them at the most inappropriate times. If you want to keep up with the Johnson's - please do me a favor - Give us a Facebook "Like" on our fan page - Tiaras and Tantrums and follow our blog! 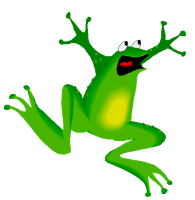 Happy Leap Blog Day!